Botox, Dysport and Xeomin are all derivatives of the Botulinum Toxin Type A protein. Commonly referred to as ‘Botox’, this procedure has been a mainstay for cosmetic medicine for over 20 years. More than 20 million Cosmetic Botox procedures have been performed with the rate of treatment growing by around 20% each year. The reason Botulinum Injections are so popular is their ability to correct and prevent facial wrinkles and deliver a very natural looking result. Regular botulinum injections are still the best way to delay the ageing process. Botulinum injections work by blocking neurotransmitters that stimulate muscles to contract. When we create facial expressions, we are contracting muscles. Over time, this produces wrinkles. Botulinum injections reduce (or even prevent) the muscle contractions that cause wrinkles. The side-effect profile of botulinum toxin type A is very good with Botox being regularly administered to children as young as 2 in doses up to ten times more than what is commonly used in Cosmetic Medicine; to treat muscular disorders and spasticities. The difference between ‘good botox’ and bad botox’ is the practitioner’s ability to place the botulinum into the correct muscle with the correct dose in accordance with the individual anatomy they are addressing. This is the ‘artistic’ side of Cosmetic Medicine and often what differentiates one practitioner from another. Dianna is a former employee of Allergan, the makers of Botox, and is trained to the highest level in the use of Botulinum. 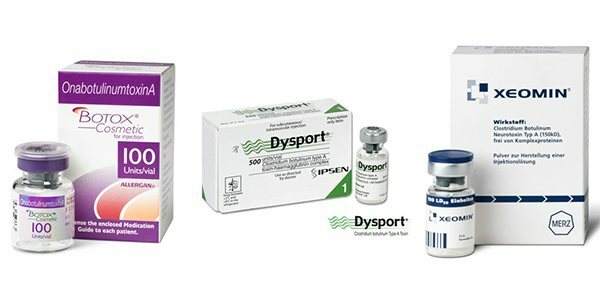 Botox, Dysport and Xeomin are Prescription Medicines containing 100, 500 and 100 (respectively) units of clostridium botulinum Type A toxin complex for injection. It is used for the treatment of severe frown lines of the face. It should be administered only by trained medical professionals. Arrange a consultation to discuss the benefits/risks of this procedure in appearance medicine. Cautions: people with defective neuromuscular transmission disorders, presence of infection at site of injection, glaucoma, pregnancy and lactation. Possible side effects include headaches, pain, burning or redness at injection site, local muscle weakness including drooping eyelids, lack of feeling and nausea. If you have side effects or concerns speak to a doctor. A charge applies. Note: Botox and Dysport treatment lasts about 4 months and after this time further courses of treatment could be necessary. Arrange a consultation to discuss your own situation.